This was from my birthday post, that happened to coincide with the first day of fall this year. It's so hard not to pick this as one of the best looks from fall, because not only are the colors super autumn-y but you can tell the grass is dying because it's becoming straw like, which happens in fall. Read more about this outfit and my thoughts on starting a new age HERE. This. Dress. !!! I got this from ModCloth over the summer and am completely in love with it. This dress comes in red too, and almost two years ago I ordered that one but something about it I just didn't love-though the fit was awesome. When the yellow version came out I couldn't help it but fall in love, and this one suits my personal style more. I meant to wear it, like, ALL summer but that was never to be the case. A bachelor party got canceled, I realized an engagement party was themed and Hawaiian, and so forth! Though I wish it didn't sit on my hanger for so long, it really is such a great fall dress too that I suppose the wait was worth it. I wore this to the Denver History Museum because they were doing an exhibit of popular toys from the 1950s through the 1980s. It was starting to get chilly out, hence the boots and cardigan. This was one of the best vintage finds of my life. About a year ago I nabbed it on eBay for like, $20. This should have been at least $120 so this was a very lucky find! 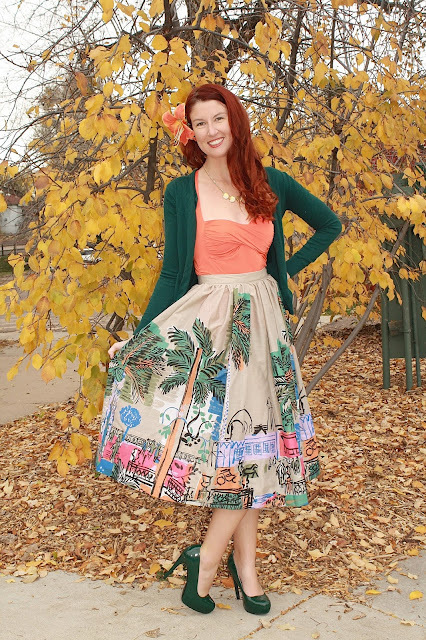 How great of a fall skirt is it too? Usually I get stuck on pairing it with a maroon color red, but I'm glad I branched out a bit and wore it with this olive shirt and shoes instead. 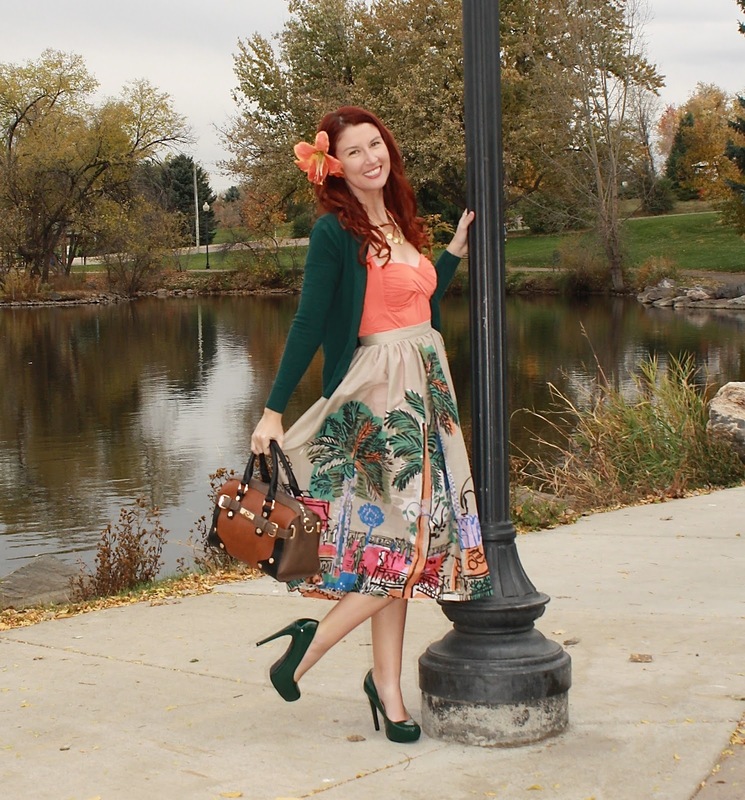 This is one of my favorite skirts ever and while mint and green are not "typical" fall colors, this whole shoot was during the time period where all of the leaves were popping. Read the post HERE. This is one of my newest vintage skirts! Because it has so many colors in it, this is an easy one to convert for all seasons. Here's the fall version and the original post is HERE. The fall dress that I thought was only a summer dress! I LOVE this Tatyana dress and so thankful that I own it. The photos had a natural haze to them and I'd call this one of the best fall posts that I had. Read all about it HERE. This was taken on an early November day while I was out to brunch with girlfriends. Since I hate acting like my life is perfect--something that happens accidentally when we utilize social media...especially involving clothes and such--I want to share what was REALLY going on in this photo: pain...and a lot of it. I have a rare pain disorder that singles out the tissues in my rib cage. A lot of people get it on a one time basis due to an isolated incident, but a few of us lucky ones have it on a more chronic level and can sneeze wrong and we have a flare up. I was wheezing the day before, opted not to take my inhaler (picking a poison essentially, because I'm slightly allergic to my inhalers ::face palm::) and I paid BIG TIME for it the next day. I had been in some pain off and on since August, but not in a big way. At 9AM I felt like something was stabbing my chest and my year long streak of having a (huge) flare up was over. I rallied, because in case it's not properly documented already that I'm kind of a tough cookie. That said, this was a tough day..."tough cookie" or not. I only share because if you're looking at fashion bloggers take daily photos of smiling faces and pretty dresses...trust me, not every day is golden so never feel bad about your life!! This is insight into one of those "off days" that I had, though you could never tell in this photo. This was taken in November after my day and right before heading out for a girl's night. This is one of my personal favorites from the fall. This was taken amongst the last hour of daylight before heading out with friends, and is one of the last true fall looks I did this season. Denver is tricky because it's hot until it's not, and then it's more winter. But luckily we did have some true fall weather and foliage, so this year I got more than expected. Below is a close up...including a shot of my NEW Instagram handle as I have recently changed it. Because it's my full name, this will be the last time that I will ever change it as my name can follow me wherever this blog leads and with whatever projects I add on! Happy winter again, folks! All such beautiful looks Lauren! I think my favorite is your birthday one. That skirt! (Insert heart eyes fave here.) Im glad the colors of Fall had finally poped for you this year! Im so used to the PA falls and have never really seen one apart from the east coast. 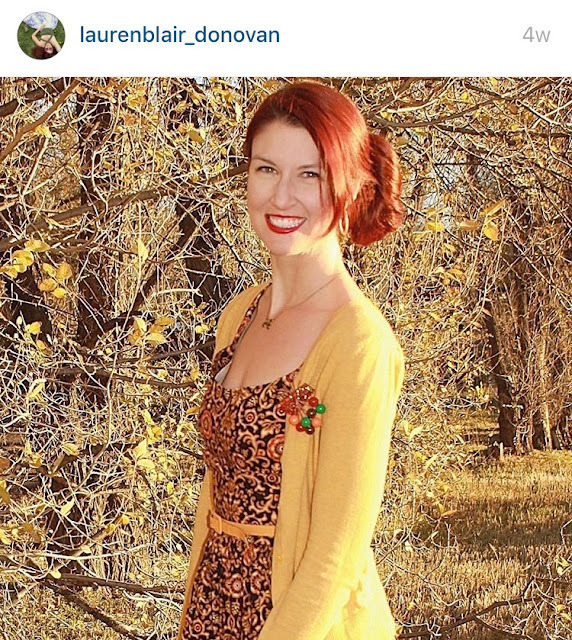 Hello, dear Lauren Blair! Can't believe I have now some moments and can see your outfits, all lovely! November and December are so hectic months for us all! January will be better, for sure! I loved your outfits, all of them, the new vintage skirt, the boots for the museum and that amazing skirt with fall colors! And I love your hair! The shoes are perfect too, every pair, especially the boots, like I mentioned, so cool (I love boots)! I know what you mean, I am always stating that social media is making lives golden, everybody is a bank president :) with boats and so on, and I don't get it. I am sorry you felt so much pain due to the pain disorder that affects your rib cage, and you are right about the inhaler (one of my brothers used, now not anymore, it was painful to see him in pain). I don't take pictures everyday, just on Sundays :) I hope you are fine now and I hope you have an amazing Christmas time! Enjoy it a lot with family and friends! Love all of these looks! I love outfit roundups! My favorites are the ones with your two vintage skirts! Though that picture of you in front of the mural is really super awesome! Super cute looks. 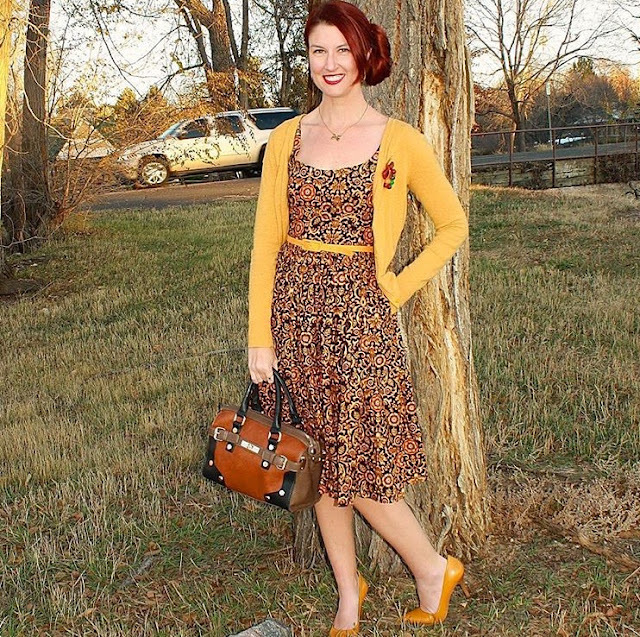 That ModCloth dress is perfection on you! Love the recap! So many great looks and a stylish season. Amazing photos, you are looking so beautiful in these styles! U have a thing for skirts. I love all ur looks and the skirts u wore.